Each year I feel so lucky to be able to meet so many awesome people at Longevity, and this year was no exception. One of my favorite parts of the weekend was being able to meet Solla Eiriksdottir, a vegetarian chef who I just love. She is so much fun, so creative, and so practical in the kitchen. Beet Sweet Potato Soup is a recipe in her Raw cookbook, so I just had to make a big pot. First, I have to tell you that beets are one of my favorite ingredients. When I was younger, I used to hate them — I thought they tasted like dirt. Years later, when I became immersed in Chinese medicine and I learned the value of beets, I began playing around with them to make them taste good to me. It’s funny, because my daughter used to say that beets tasted like grass (I guess the apple doesn’t fall far from the tree…) and now, she’s a lover too. And sweet potatoes… well, who doesn’t like these gems? And do you know about the 5 Health Benefits Of Yams And Sweet Potatoes? I love to customize recipes for specific health concerns. So, when my clients ask me to put on my health coach and chef’s hats, I often customize recipes for their specific needs. Let me customize a soup recipe for you that will work for whatever’s going on in your body now… I’m such a geek that I really do get excited about doing this. So CLICK HERE to be taken directly into my calendar to sign up for your free phone consultation… I’d love to create a soup recipe that addresses your specific needs! Okay, so what’s so great about beets? What am I rambling on about? Well, in Chinese medicine, we know that many illnesses and conditions in the body are caused because the body is not making good quality blood. Beets help the body make high quality blood. Beets are great for energy. They increase athletic performance. They are good for your heart. They help ward of cancer. Need I say more? And, as an added benefit, they just make everything look beautiful — I mean, just look at the color of this beet sweet potato soup! When you add olive oil to foods, it actually helps deliver the nutritional benefits of your food to your body in a better way. All of the benefits of the food’s color pigments get transported where they need to go. I drizzle a good quality extra-virgin olive oil on top of everything. This is the creamiest, most delicious soup! It's an energy booster that's great for your heart and your digestion. Add onions and season with salt and pepper. Cook, stirring often, until onions are softened, about 5 minutes. Add beets, sweet potatoes, turmeric, cumin, smoked paprika, and red pepper flakes. Cook, stirring for 2 minutes. Bring to a boil, then reduce the heat to low and simmer for 45-mins or until the beets are softened. Transfer the soup, in batches, to a blender and blend until completely smooth and silky. 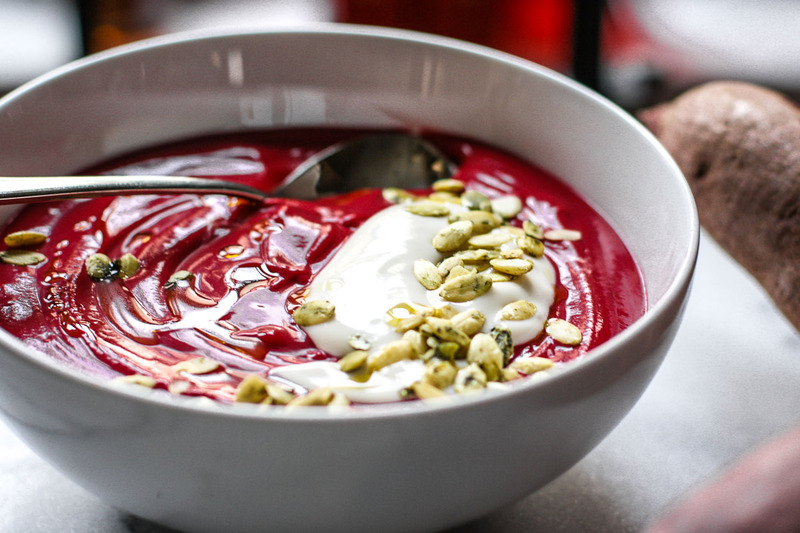 Ladle into bowls and garnish with a big dollop of yogurt, a sprinkling of pumpkin seeds, and a drizzle of olive oil.